Salsa, the Italian or Spanish term for sauce. A refreshing, cool and spicy dip from Mexican cuisine, which tastes awesome when served along with chicken or fish. 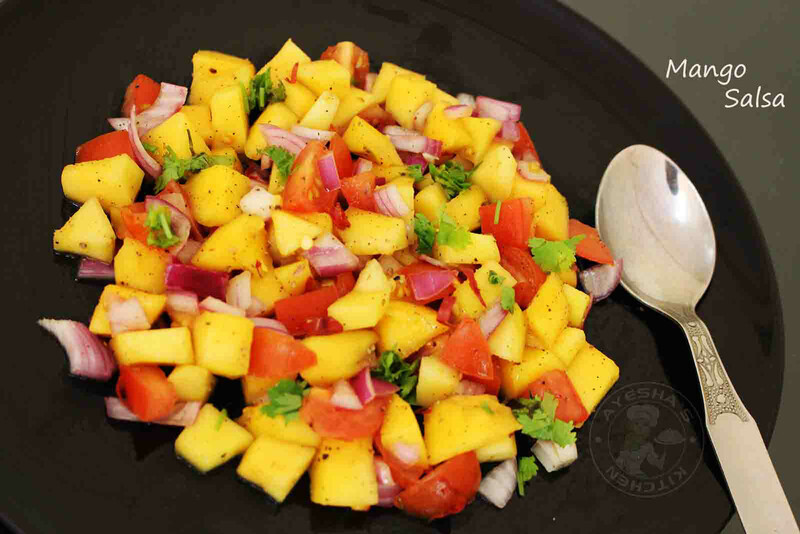 Here am with a Mango Salsa recipe to enlighten your main course meal. It is very hard to avoid some dips or sauces along with Fish recipes, especially for grilled recipes. Mangoes are perfect when eaten on their own, delicious when added in salads, when it is turned into yummy puddings and when added to mango salsa to side with grilled chicken or fish. Ripe and a bit firm mangoes are used for making mango salsa. This sweet tangy and spicy side dish is perfect for a gathering along with some chips. You can make mango salsa either spicy or mildly spicy as per your preference. If the mangoes are more acidic, just add some chopped avocado and make Mango avocado salsa. 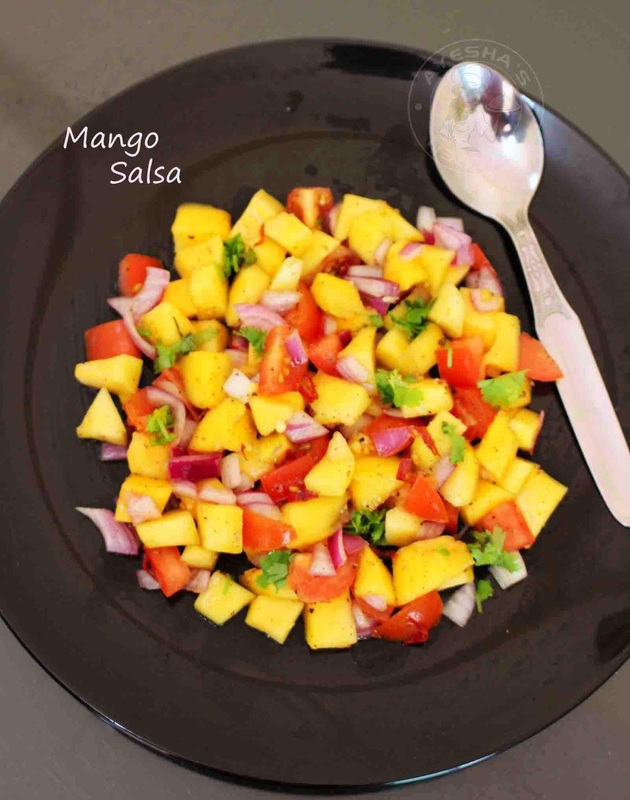 Try to use ripe but a bit firm mangoes for a perfect salsa recipe. You can also try Mango pineapple salsa, avocado mango salsa, avocado salsa recipe the same way. Hope you all will enjoy this savory sensation. Here is the recipe showing how to make mango salsa recipe /simple salsa recipe /Mexican mango salsa recipe/recipe for homemade salsa. Add chopped onion, ripe mango, tomato and bell pepper in a bowl. Combine them together. To this, add the seasonings lemon juice, pepper powder, sugar, salt, chili flakes, olive oil and then garnish with chopped coriander leaves.